Over time, many, many readers have asked me how I keep myself organized and find the time to maintain The Simple Dollar, work a full time job, handle a family life that involves two kids in diapers, and have any free time at all for other pursuits including some degree of intellectual curiosity. It’s not easy, and the only way it’s worked at all is by putting together some basic organization techniques that keep things in focus. So, without further ado, here are the basic tenets of how I manage all of this stuff and keep things moving forward, with a lot of visual help along the way. If you have any questions, please ask them in the comments, because if you’re thinking of a question, chances are someone else is too and it makes sense to ask there and have my responses there, too. I keep a very simple Mead pocket notebook and a pen in my pocket at all times (hence the beat up look). Wherever I’m at, if an idea pops into my head, I jot it down in this notebook. I’ve even pulled off the road to do this and I’ve also been known to pull this out during conversations with others if they cause me to think about something. What goes in the notebook? Anything and everything: tasks I need to do, words I want to look up, ideas I want to research or follow up on; all of these things are fair game. I usually write one distinct idea per page so that I can make “sub-notes” underneath it. Let’s look at a couple of examples from the notebook to see what I mean. 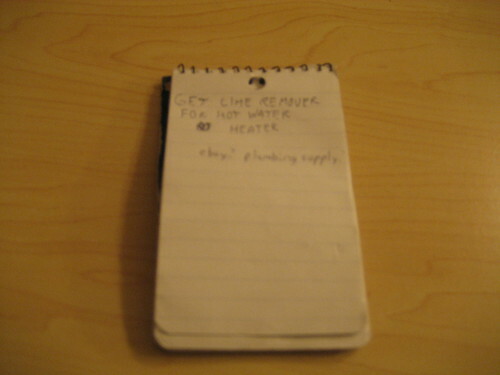 When I open the notebook, the first item I find is a note reminding me to “get lime remover for hot water heater,” and under that I jotted “ebay? plumbing supply?” This was the result of a conversation with a person who installs hot water heaters for a living. I described to this person that my hot water heater was making a “percolating” sound, much like a coffee pot, and he immediately suggested that I try running lime remover through it. I pulled out my notebook, jotted that down, and asked him where to get it – obviously, he said to try eBay or a plumbing supply store. This is a note reminding me to follow up on a pont of intellectual curiosity. Here, I read an article from the September 2007 issue of The Atlantic about Karl Rove and I found that he was politically inspired by the presidency of William McKinley and that of McKinley’s advisor, Mark Hanna. I wanted to follow up on this to learn more about McKinley and Hanna, a pair I had only brushed upon once a long time ago. On an average day, I’ll make ten or so notes like these. They’ll vary as much as these two do, from areas of intellectual curiosity to tasks that need to be completed. However, just making notes doesn’t mean that I do anything about them. I follow up on these notes once a day by putting them all in my inbox, then processing it. It consists of a folder (which contains several things I need to review that you can just see peeking out), two envelopes, a black pamphlet between the envelopes, and two pieces of paper torn out from the notebook. This is actually rather thin for my inbox – often, it has as many as thirty things in it. Note that I don’t actually have a plastic or metal inbox – it struck me as an unnecessary expense, which I suppose reveals my frugal nature a bit. If it takes less than five minutes, I do it immediately. 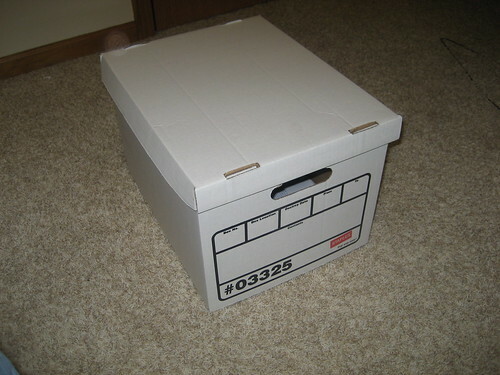 If something afterwards needs to be filed, I just put it in my filing box at the front of the box, then every once in a while I file this stuff away. This actually winds up being the majority of the stuff in my inbox. If it’s a longer task, I try to break it down into smaller pieces and try to do the first piece of it. I usually wind up sketching out at least the first few steps of a longer task in another notebook (that you’ll see in a minute) and then each day I’ll check each of these longer tasks and make sure I’m moving forward with them in some fashion. This keeps a lot of moderately complex tasks urgent for me. If it’s food for thought (like a book or a magazine or a note to research something), I put it off to the side in a “thinking” pile to deal with later on. This “thinking” pile can get quite large, but I really enjoy going through it when I have an hour or two to burn, as it provides almost all of my creative ideas. If I get into a routine of trusting my inbox, then I don’t really have to remember much at all and can instead focus on just getting through the stuff I need to do, and that’s a giant relief. One of these boxes is bill statements, receipts, and tax documents for the last seven years; the other one is instruction manuals and other materials. I plan on moving to an electronic filing system in the future when I get a true workstation set up, but for now the paper filing works fine. For the most part, I just stack stuff that needs to be filed inside the box, then file it into the folders about once every month or two. This takes care of all of the paperwork miscellany that would otherwise be floating around. 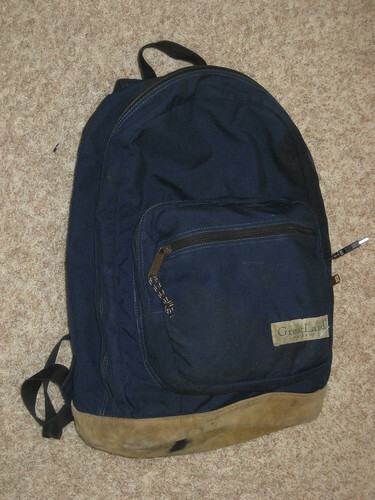 Yet again, I reveal my frugal tendencies: this is a backpack I’ve had for twelve years, and it was originally picked up used at a garage sale. There’s an ink stain on the bottom that I picked up from an exploded pen circa 1999. It’s also been sewn back together at least twice. It does the job I need and I’m not desiring to impress anyone, so I’ll likely be using it until it falls apart. From left to right (roughly): a baggie containing several essential cables, a small number of books (with the recently reviewed The Paradox of Choice, a copy of What Color is Your Parachute? 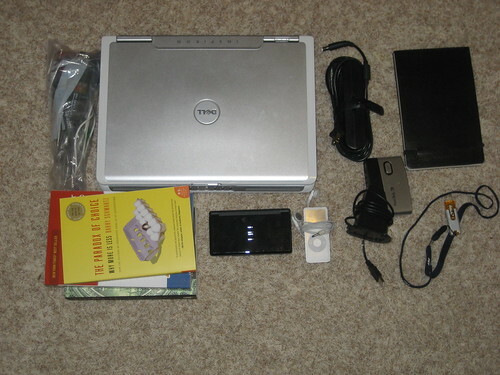 2008 under that), a Dell Inspiron 1505 laptop, a Nintendo DS (a few games are also in that baggie with the cables), an iPod Nano, a power supply, a card reader that can read about any small memory card under the sun, a memory stick, and a Moleskine reporter’s notebook. Not pictured but always present in the bag are a file folder (seen in my inbox picture and which usually contains a few documents plus at least some of the contents of my inbox), a few pens (I was actually out of them at the time I took the picture), and the digital camera with which the picture was taken. The reporter’s notebook, though, is much more interesting – it’s my “project” book. Each page in that notebook equates to a project that I’m working on. That page is a list of the specific steps that need to be done to get the project done. Whenever I finish one, I cross off that step in the notebook, and I usually try to keep at least a couple steps into the future written down for each project so I can see where I’m headed. 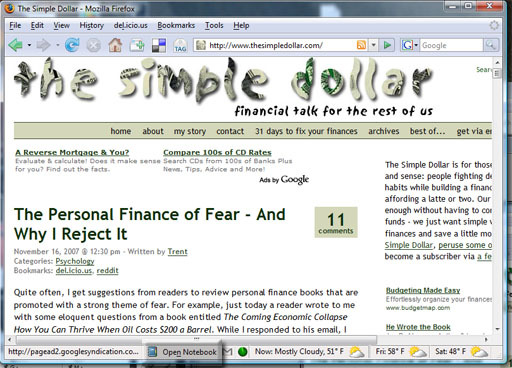 For example, if I write a series for The Simple Dollar, a project would likely consist of a list of the basic concept for each post in the series, and I’d cross them off as they were fleshed out or else discarded for some reason. This keeps me on the ball for every long term project I’m working on, breaking them down neatly for me into nice, discrete steps. As I’ve mentioned in the past, I use Mozilla Sunbird as my primary schedule keeper. Within it, I basically keep track of every possible timed event in my life, from the usual appointments and birthdays and anniversaries to things like infrequent home maintenance tasks. The tasks listed here are basically an extension of my inbox – I use the automatically generated “to do” lists that Sunbird can spit out for you to see the things that I need to be doing on any given day. Let me walk you through an example of how it works. Let’s say I’m out and about and I hear about a blogger meetup in Des Moines on a Friday that I happen to be available. 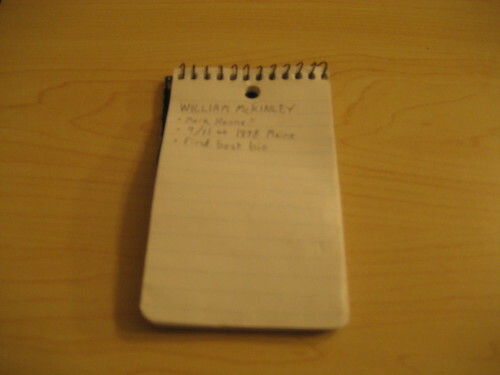 I jot this info down in my pocket notebook and, when I get home, I toss it in my paper inbox and start processing. When I get to that item, I go ahead and fire up Sunbird and enter that event so I can then crumple up the sheet. After I fire up Sunbird, I notice that it’s been three months since I changed my air handling filter in the house, so I enter the event, then run downstairs and change the filter. If there’s more than one scheduled event in a day, I usually print off a copy of the day’s schedule so that I have it with me and don’t have to fire up my laptop to check on things or to make any last minute changes – I just edit with a pen and keep going. Obviously, when I’m busy at my computer, the last thing I want to do when I have an idea or a task is stop, pull out my pocket notebook, and jot something down. Even when it’s sitting on the desk next to me, I still don’t usually want to stop and jot down that idea. Yet I want to also be able to easily retrieve any ideas and notes and tasks I have on my computer from any computer, and for that exact purpose, I use Google Notebook. This little window pops up. Within it, I can just jot down any idea I have in a very free-form fashion. I can also separate them into different “notebooks” to keep them somewhat organized. I just click where I want to write and just jot down the thought, and if I want to, I can drag in pieces of web pages that I’m on as well. I basically treat this as an extension of my inbox, processing it each night. What’s most useful about this is that I have this plugin installed on every computer I use regularly, plus I can access the notebook from any web-accessible computer. 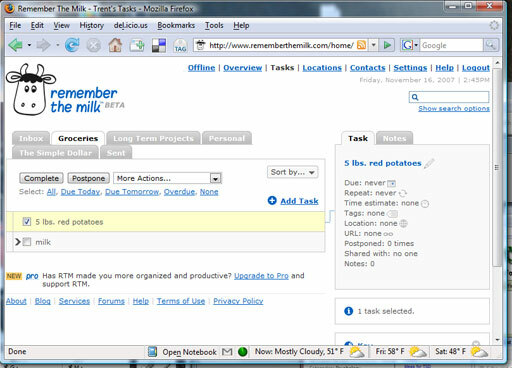 Another absolutely vital piece of organization for me is Remember the Milk, a website I’ve written fondly about in the past. Remember the Milk is basically a very convenient list maker; for example, you can use it to make grocery shopping lists or Christmas gift lists. Why would one bother to use this for a grocery list, you might ask? Let me paint you a picture. Throughout the week, we do jot down our grocery list using a piece of paper on the fridge and I sometimes also note ingredients in Google Notebook for things I’d like to try making. My wife and I will go over this, just to make sure we haven’t forgotten anything, and I’ll make the “master list” with Remember the Milk, which seems pretty mundane, right? 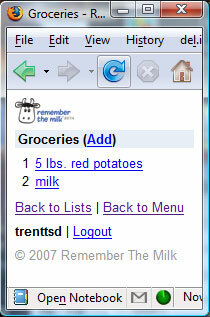 If you visit m.rememberthemilk.com, you can access your shopping list from any web-accessible cell phone, like mine is. So, when I get to the store, I just log onto the site on my way into the store and there’s my list. What’s special about that? Let’s say my wife thinks of a recipe she wants to try after I’ve left. She just logs on, adds the items to the list, and I have the complete, correct list when I get to the store. A similar logic applies for Christmas gifts, or a list of errands to run, or pretty much anything else you can imagine from a checklist. One last important aspect of my personal organization is email. For this, I follow three simple rules. First, don’t close the email program without emptying the email inbox. This means deleting the junk, reading each message, and either dealing with it now or adding it to Google Notebook. I empty the inbox, then close the email program and don’t open it again all day. I usually only do email twice a day at most unless I have five or ten minutes of idle time that I can use to shorten my email session later in the day or tomorrow morning. 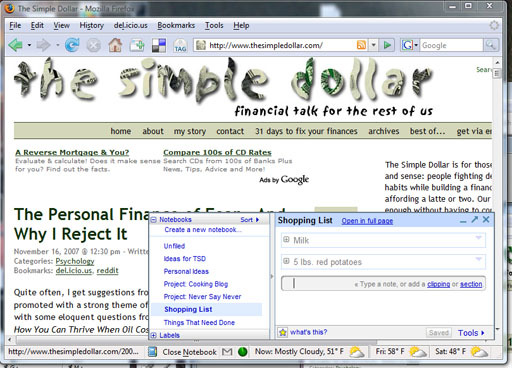 One quick thing I do that helps with this is that I use the Quicktext extension for Mozilla Thunderbird (my preferred email program; again, both are free). This plugin lets me respond to most of the common messages I get very quickly – I have nine of my most common responses pre-written with fields that automatically fill in names, and so I just hit Ctrl-R to reply, then Alt-0 (or any other number) to insert a message automatically. This does most of the email response work for me. Second, don’t save it unless you need it for reference. If you’ll need the message for reference in the future, save it. Otherwise, delete it. Some people insist on saving every email, then they can’t actually find the useful items amid the thousands of saved messages that really don’t mean a thing. Unless you’ll need it again in the future, delete it now. Third, if the amount of mail is too overwhelming, delete it all. If the message is actually important, the person will contact you again. If it’s not, well, why bother reading it to begin with? I usually use this approach when I return from a vacation from email – I just wipe all of it out if I open up my email program and feel utterly overwhelmed. In the end, there’s really only two principles behind everything: don’t lose an idea, but don’t get overwhelmed, either. Everything else is just a specific implementation of one of those two ideas or a way to resolve them when they conflict with each other. If you want to track down some of the ideas that contribute to this philosophy, here goes. First (and most obvious) is the book Getting Things Done by David Allen. It’s been written about over and over again online, but that’s because it’s really useful. However, for most people it’s like trying to shoot an elephant gun to kill a gnat. Just read the book and pull out only the pieces that you need for your own life. If you’re looking for more, I compiled a list of great personal productivity books a while back – and they’re roughly ordered in their level of usefulness. 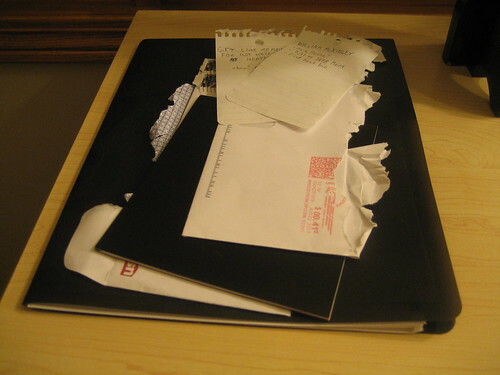 Inbox Zero by Merlin Mann at 43 folders, explaining in detail the value of emptying your email inbox. Zen to Done by Leo Babauta at zen habits, which focuses mostly on mental strategies to get things done. 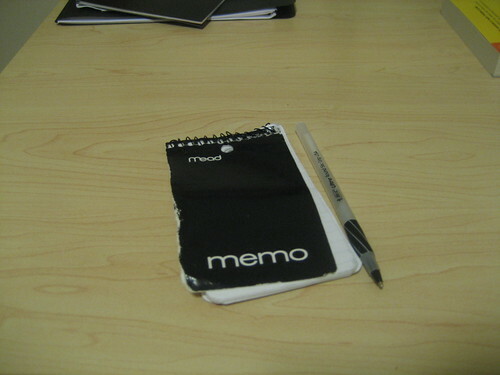 The Hipster PDA, again by Merlin Mann at 43 folders, which explains in a somewhat humorous tone the value of keeping something in your pocket to jot stuff down on.